What does it mean to learn? How do we measure what and how much someone is learning? How do we learn and what are the best methods of teaching? I have asked this of myself countless times since I started homeschooling. I have challenged myself to set aside everything I was ever taught about learning and come up with my own brand and definition of what learning truly is. I’ll never forget my first day of homeschooling my two boys. I had prepared well ahead and ordered all of the books I thought would constitute a great education for an elementary aged child. I had a book for math, spelling, history, english/language arts, age appropriate literature, science books, work books. . . you get the idea. I had gone to great pains to make our upstairs game room a bright, knowledge building resource. Charts of every kind, maps, rulers, crayons, sissors and the like. I was organized. I was real organized. There was a specified time for each subject. Well, I’m sure you know where this is going. It was a COMPLETE disaster. We spent about six hours up there and by the end of it we were all crying. I felt hopeless. I felt like I couldn’t do it. I felt like I just wasn’t cut out for this homeschooling stuff. Right about that time, I crossed paths with a woman that had been homeschooling for a while. I told her my plight and that I didn’t easily give up on ANYTHING, but that I was very fearful that my kids would grow up to be dumb dumb’s if I homeschooled them. I told her I just didn’t think I had it in me. She laughed. “Throw some legos in the floor, turn on some music and read a book to them while they play,” she said. What???? You mean let them play? That went against everything I was ever taught. Learning was hard. Learning was something you had to do first in order to do what you really wanted to do. Learning was not fun. Thus began the shift in my paradigm regarding learning. Slowly, VERY slowly, I began to let go of the fear that I would be one of those careless moms that let their kids grow up to be just plain stupid. This took more recalibrating in my own head than it did planning activities for the kids. We would have a day where we would sit around talking and playing Legos. . . I would freak and pull out the old school books and drill them for hours on reading and math skills. You can guess which days were more successful. Over a period of time, yes years, I finally started letting go of what I had learned about learning. I had been through the one size fits all public school system, you see, and had to overcome the doctrine of that mindset. I was shocked and amazed to see how much my kids learned in regular old daily life, with no particular agenda. I started asking them what they were interested in and we would pursue it with gusto. They learned math at the grocery store and in the kitchen making their favorite cookies. They learned reading sitting by a cozy fire, drinking hot chocolate while I read to them. Then they read to me. We learned about science taking walks or better yet “adventures” along the bayou that runs behind our house. We learned history by visiting grandparents and talking about life. My kids learn so much simply by being who they are. The world has become our classroom and our creativity is revived and kicking. I have learned that we can build skills in everything, yes EVERYTHING we do in life. We must remember to rely on our curiosity and not on some standards that someone else sets for us. I trust my kids. They have been learning since they were born and thankfully the love of learning is just growing stronger for them, as it is for me. Each person has such unique gifts to give to the world and when encouraged, those gifts turn into tangible skills that can be used to build a well rounded beautiful life with plenty of time to stop and smell a rose. . .
That rose might just teach us something about life. If you’ve read my post titled Life is a School you know that I started my homeschooling adventure entrenched in the traditional school ways. Afterall, I myself, had gone through public school. My husband had survived it. So had my twenty-four year old daughter. But I had decided to homeschool my two boys for various reasons and I really believed that they needed to study in every subject – every day. We set out on the path with spelling, math, literature, science and history books in hand. I quickly realized that the boys were very willing and able to buck the system. And buck they did, leaving me perplexed about how I was going to survive one year, let alone an entire education with each of them. Thus began my inquisition into how people learn and how best to teach two young boys. MY two boys to be exact. If you’ve Googled Homeschooling, you already know how much information is out there. I was overwhelmed to say the least. And not only that, we had already spent a small fortune on age appropriate material for each of the boys. I really wanted to utilize those materials if possible. While searching, I came across a few articles about unschooling. I was intrigued. The articles talked about letting your kids follow their own interest. They talked about just spending time with your kids and talking. They talked about staying present with your kids and really trusting them to learn what they needed to learn and encouraging them in the ways they wanted to go. I absolutely loved this idea. I wanted to implement it immediately. But, I got scared. I saw the school kids in our neighborhood learning multiplication facts and doing difficult science projects. They had hours of homework, after having been in school for seven hours. My kids were playing with blocks and Legos all day long. I pulled out the old school books and quick. I was surprised that they could do the “grade level” worksheets I put in front of them, even though we hadn’t had any formal lessons on the subject. They would dutifully appease my fear by sitting at the table, pencil to paper, heads hung low and miserable, gazing longingly at their Legos, wondering when I would let up. After several of these episodes, I realized that in order for unschooling to work for our family, I was going to have to unschool myself. I was going to have to let go of being attached to HOW my kids learned and TRUST them to learn by being who they are. I was going to have to listen to them and ask them what they WANTED to learn. After years of teetering back and forth between unschooling and die-hard school work I’ve learned to let go of expectations and realize that my kids have many interests and that when they are pursuing their interest they are learning – math, spelling, grammer, history, science and art. When they are following something they are interested in, they are much more motivated to learn what they need to learn in order to pursue it. So, we play video and computer games, we draw, we read books, we take walks, we cook, we clean, we garden, we take care of grandparents, we play games, we live, learn and love life – together, without grades, without agendas, without trying to get anywhere other than where we are right now. And it is wonderful! It is really preposterous to believe that a child will not learn from the world around him. It’s really the only way that anyone learns. We have been brainwashed to believe that the only way to learn is in school. It was slow moving and very difficult for me to let go of my upbringing and have the courage to do something different. But the rewards have been great. My kids are very well rounded and happy. They are excited to get up every day and are living a life far beyond what I ever imagined was possible. My husband and I are raising thinkers. They will always think for themselves and never be afraid of asking the big questions.They will trust themselves to pursue what is in their heart and ask what they need to ask to get there. There are no F’s in our house. . .or A’s, B’s, C’s or D’s. That’s the attitude I want my kids to have. And you can’t get THAT on a graded paper at school. This is such an awesome technology. I am by no means a “techie” but luckily my husband is and found Dropbox. It is a “cloud” service where you can upload files to the cloud and it serves as a backup. You can also share files with friends and family. Happy Day! No more emailing files back and forth. All you do is save your files to a Dropbox folder and you can share it with anyone you invite to that shared folder. The service is free. There is an upgrade you can purchase but I have found that what they give away is sufficient for my needs. My husband has purchased the upgrade. You can earn more free space by inviting friends to Dropbox. My husband talks more about Dropbox from a “techie” perspective at his Blog. As far as schooling goes, this has been great. I purchased a Unit study from Currclick, but wanted to use it with both of my kids. They each have their own laptop and since the Unit Study is so internet intensive, I wanted them to be able to have a copy of their own. Dropbox to the rescue! I just saved the Unit Study to the Dropbox folder, invited my boys to Dropbox, (got more space for myself), and voilà! They both had their own copy of our Unit Study right on their own computers. I have also shared files with friends. Everything from podcasts to writings I’ve done, to music. As long as you save it in your shared Dropbox folder whoever you invite has access to it. I am such a sissy when it comes to new technology, but honestly this is so easy and so worth it! I highly recommend it to anyone that ever purchases downloadable material for their kids. It makes it easier, quicker and allows everyone to be on the same page. Literally! Here are some quotes I love about learning. Click on the author’s name to learn more about that author. There is no need to educate. It is not that you read a book, pass an examination, and finish with education. The whole of life, from the moment you are born to the moment you die, is a process of learning. The only things worth learning are the things you learn after you know it all. The least of the work of learning is done in the classroom. I love the internet. It’s really changed our world and allowed us to communicate, create and share in ways that I never thought possible. Zimmertwins is one of those unique websites that provide an awesome learning experience for our kids, and the fantastic thing is that our kids don’t even know they are learning while they are creating. 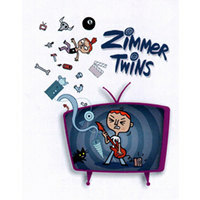 Zimmertwins started for my family as a fun website for my oldest son. He loves animation and loves creating cartoons. He uses good old fashion computer paper and crayons, Toon Boom programs, and just about anything he can get his hands on if it involves drawing or animating. We initially bought him a one month subscription to Zimmertwins hoping it would provide him with another avenue to express his creativity. And boy did it! But what I didn’t know was that he was going to get motivated to write and spell beautifully. Zimmertwins provides an easy to use, self motivating arena for kids to develop writing, spelling, vocabulary and artistic skills while having fun. Zimmertwins won the Parents Choice Silver Honor award for kids websites in 2009. The website features Eva, Edgar and their cat 13. These characters have some pretty spectacular powers and there are oodles of backgrounds and props that can be changed frame by frame. The charachters talk via conversation bubbles that the child creates but sound effects and music can be added to the movies with a simple click of the mouse. The characters move through the scenes that the child creates first in his mind and then on the screen. When the movie is finished it is given a title and description by the child and then posted on the Zimmertwin website. The Zimmertwins community (which is made up of the kids with accounts on Zimmertwins) rate each others movies, comment on them and can save movies they like to their favorites. They can earn a “Crowd Pleaser” if at least three users rate their movies with five paws. More rare are the coveted “Must Sees” which are awarded by the Zimmertwins staff. When a child receives a “crowd pleaser” or a “Must See” he is rewarded with front page status on the Gallery page and a cool symbol placed on his award winning movie. The site is well monitored by the Zimmertwin staff. A flag system is in place for the community to self monitor as well. My older son had a movie pulled off for something that seemed minor to me but it was reassuring that the site is highly monitored. I feel confident that the staff is diligent in keeping Zimmertwins a kid friendly environment. My son used to hate writing and spelling. When other kids started commenting on spelling errors, he was motivated to get a dictionary and start learning to spell better. He also started using the thesaurus and building his vocabulary. His went from sporadic random stories, with no real structure to stories with a beginning, middle and end. They started getting funny and interesting. Not only that, his new skills started spilling over into his work outside of Zimmertwins. Peer review certainly played a big part in his desire to become a better writer. When he started earning crowd pleasers and then his first must see, he was hooked on writing, spelling and reading. He now loves to write stories and reports and his spelling and vocabulary have greatly improved. It has also opened up our conversation to matters of grammar, punctuation, contractions, verbs, adjectives and nouns. He is much less resistant to these ideas since he started working on Zimmertwins. I don’t think it’s coincidental that the world of reading has opened up for him as well since he began working on this site. I assume this is because he can spell better, understand words better and therefore understand what he is reading better. My youngest son saw his older brother receiving a lot of attention on Zimmertwins and decided he wanted to give it a try as well. I have seen major improvement in his writing and reading skills in the two months he has been experimenting with Zimmertwins. It’s been one of the most effective tools in getting my kids to write and spell that I have ever used and believe me I have tried lots of things. There is a free account. The child can make movies on the free account but they don’t have access to as many features and they cannot rate movies nor can their own movies be rated. Also they cannot receive comments on their movies, which I believe is the motivating force for getting their writing skills better. Since their movies can’t be rated they are not eligible for the “Crowd Pleaser” or “Must See” awards. Monthly membership is currently $3.95 per month. A six month membership is $19.95 which is like getting one month free. Payment is made through Paypal. The VIP membership includes all available tools and backgrounds, sounds and music on the site. Kids are able to comment, rate and review other VIP member movies. They can earn “Crowd Pleasers” and “Must Sees” with the VIP membership. Zimmertwins also provides starters to movies if your child is having a hard time getting an idea going. There is no contract. You can pay month to month. There are no automatic charges. If your paid subscription is up the kids account is downgraded to the free account with everything being saved. The parent is sent an email advising of the expiration of the VIP status. The parent just clicks the link in the email to reinstate his childs account. Nothing is lost or removed. The moment payment is made the child is back at VIP status. Parents must give permissions and an email address before the child can obtain an account. The child picks a nickname to use on the site and a password is generated by the system. This information is emailed to the parent and then the parent can help the child change the password if desired. I have emailed the Zimmertwins staff several times and they have always been prompt with a reply. Zimmertwins at School is a new website created by the makers of Zimmertwins, with educators in mind. The site is a set up a lot like described above but is maintained and managed by a teacher or homeschool mom. You can set up to 40 students in a “classroom” on the site and give assignments on what types of movies you would like your students to make. This could be used to animate History, Science, Math, Music or just about any subject that you want the children to work in. Watch a seven minute demo here. The only difference I see between this and the Zimmertwin site is that the movies that the children make on Zimmertwins at School are retained inside of your classroom and can be rated and reviewed only by their peers inside of that particular classroom. The movies are not put out for the general public to view. Since my family consist of only two homeschoolers I am going to try it and add some of their homeschooling and non-homeschooling friends and see how successful they are and how much participation I get. After I have reviewed it for the free trial period, I will write a new post giving an update. An ideal scenerio would be to get kids from your homeschooling group or coop, if you belong to one, and take advantage of setting up a full classroom. You can give “assignments” and the kids can work on them from their own homes with the login that you give them. I love that the Zimmertwin team is trying to get into the education system since I’m all about having fun and learning while we’re doing it. I love things that bring the learning part in through the back door and the Zimmertwins do just that! After the free trial the cost is only $89 per year! That is a real bargain when you’re talking about motivating kids to learn spelling, writing, reading and every other subject imaginable. I hope this review has inspired you to give Zimmertwins a try. I do not receive any free services or compensation from Zimmertwins. This is truly a program I believe in solely because I have seen such improvement and motivation from my own kids. If you try it, leave me a comment and let me know what you think. You are currently viewing the archives for April, 2012 at Michelle Conaway.